Valentine’s Day is approaching quickly, and sweet cards and aromatic roses are everywhere. The question on every wine lover’s mind? What wine goes with chocolate? There is no one wine that pairs perfectly with all chocolates, and while chocolate and wine have a marvelous romance, finding the perfect chemistry can be complicated if you aren’t familiar with pairing guidelines. Let’s discuss the different variables to keep in mind when pairing wine with chocolate. As you would with wine tasting, order your chocolate and wine pairings from light to dark. If you start with your boldest chocolate and wine, your palate won’t be at its best for the delicate flavors ahead. You can also organize your tasting by the boldness and body of the chocolate and wine pairings you have planned. For instance, start with a white chocolate dipped strawberry and a sweet dessert wine, and end with your richest and darkest chocolate and a glass of Cabernet Sauvignon. If your chocolate is sweet, pair it with a sweeter wine. This may sound counterintuitive, but if you take a sugary chocolate and pair it with a dry wine, the sweetness of the chocolate will overpower the wine. Pairing a sweet wine with a sweet chocolate balances the flavors and helps them play together instead of each vying for your attention. It is also recommended to try a sweet wine paired with a spicy and sweet chocolate for a shockingly strong pairing. If your chocolate is bitter or strong (upwards of 80% cocoa), pair it with a bold, full-bodied wine. Disregard fruity wines, because when it comes to an intense chocolate, you should plan to pair it with an equally intense wine. The intensity of the chocolate will complement the boldness of the wine and help to bring out its exceptional flavors. The best flavors will come from high quality wines paired with high quality chocolates. Gourmet chocolates will pair wonderfully with artisan wines because each is crafted with delicious flavors that are, simply, meant for each other. When pairing wine with chocolate, consider purchasing a variety of chocolate flavors that not only offer different flavors, but different textures and ingredients as well. Consider offering a white chocolate bar with banana chips inside, or a milk chocolate and peanut butter bar. As in many chocolate and wine pairing seminars, the tasting lead will often have you first taste the wine, then ask you to clear your palate, then taste the chocolate. Once you have tasted each separately, the tasting lead will then ask you to taste one slowly and then follow it (just as slowly) with the wine. As you’re tasting, let the pairings completely coat your mouth so that you can taste the amplified flavors. 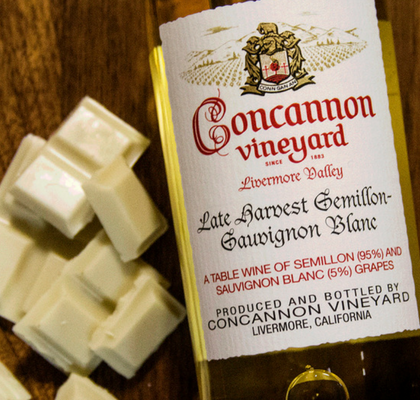 The 2015 Late Harvest Semillon comes from our Concannon Reserve Collection, boasting rich and creamy flavors of freshly baked fruit crisp. Paired with an equally creamy white chocolate, this is a delightful duo. 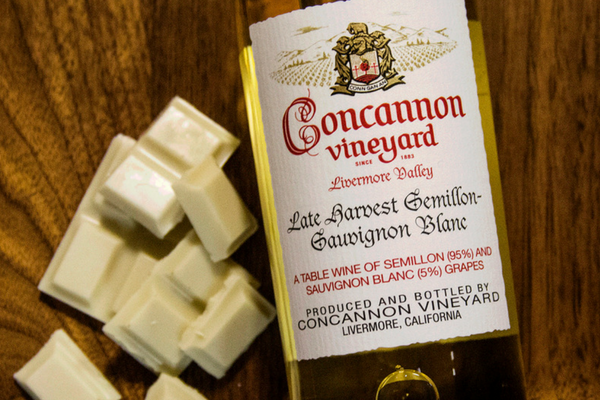 This rich and silky Viognier is the perfect accompaniment to a buttery milk chocolate. The hints of spice found in this wine are a marvelous complement to the creamy sweet flavors of the chocolate. The rich and tannic flavors of dark ripe fruits and coca spices in the 2015 CV Cabernet Sauvignon complement a slightly sweet and simultaneously rich chocolate. Full of tannins, fruit flavors, and a long, sultry finish, the 2014 Reserve Petite Verdot pairs well with a bittersweet chocolate with equally strong flavors. If you want to spice things up, try this wine with a chocolate containing peanuts or black fruit. Big, bold, and built for dark and luscious desserts, the 2014 Petite Sirah Port was crafted for a pairing like a high cocoa dark chocolate. When it comes to this wine, the higher cocoa content, the better.